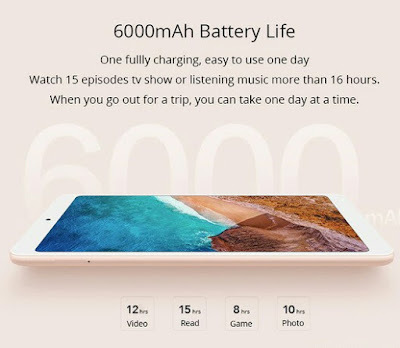 • Powered by 6000mAh High Capacity 3.7V, Lithium Polymer Battery..
Chargeable via a 5volt/2A 100-240V AC Power Adapter..
Up to four hours recharging time/period..
• Storage Capacity: 64-Gigabyte eMMC ROM..
• OS Platform: MIUI 9 Operating System.. Processor: Qualcomm Snapdragon 660 CPU..
• Screen: 8.0-Inch Display Size.. Type: FHD IPS Capacitive Touchscreen.. 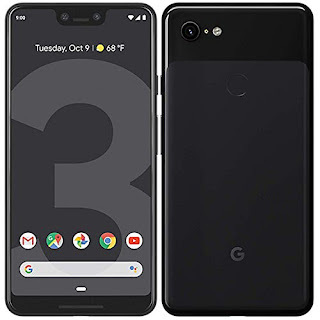 Resolution: 1920 x 1200 Pixels, 1200:1 contrast ratio..
• Image Capturing Features: 13.0-Megapixel Back Camera and 5.0MP Selfie/Face-Chat Camera..
• Wireless Connectivity: Bluetooth 5.0, WIFI 802.11 a/b/g/n/ac..
2.4GHz / 5.0GHz Dual Band..
SIM Type: Nano Card Slot..
• Audio: Built-in Double-Channel Speaker with Microphone..
• Supporting Media(Video/Picture) Formats: MPEG1, MPEG2, MPEG4, MP3, BMP,JPG,PNG, RMVB, WMV, WAV,WMA, AAC,AC-3, APE, FLAC,OGG, H.263, H.264, H.265..
• Dimemsions: 7.88 x 4.74 x 0.31 inches, 0.3425 kg..